Recall from previous tutorial, http://setup-steps.blogspot.com/2013/08/windows-server-2008-computer-name-and.html, that by default the Windows Server 2008 is set to be a member of WORKGROUP computers. This tutorial imports a Windows 2008 appliance file (Win2008.ova) as two clones. 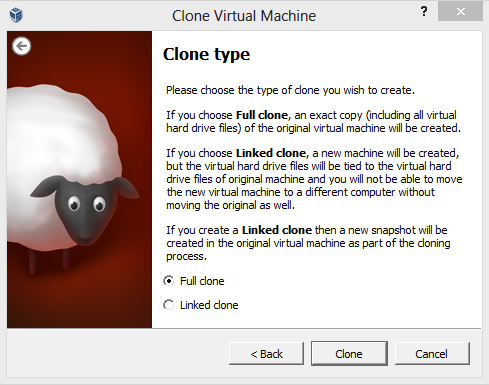 Both clones will be configured to join the same workgroup. (Click here to follow the tutorial to create your own copy of Win2008.ova). 1) Go to menu File/Import Appliance. 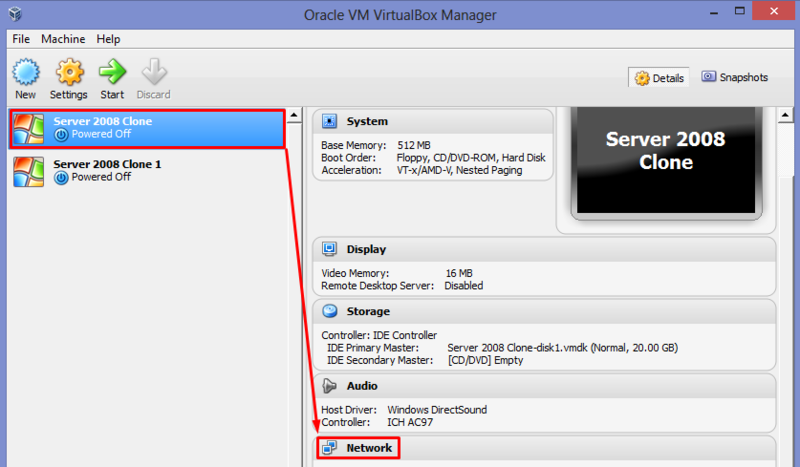 It may take few minutes for VirtualBox to import the ova file. 3) As a result, you get the first clone. 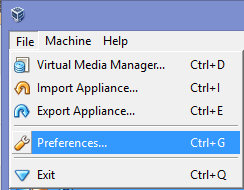 4) Right-click on the item "Server 2008 Clone" to obtain the context menu. 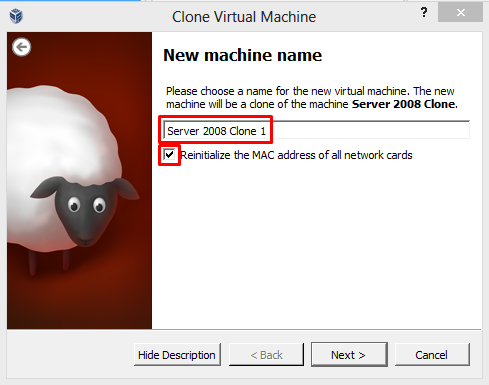 Choose "Clone..."
Rename it as "Server 2008 Clone 1". 5) As a result, you get the second clone. 6) We will configure the Network Adapter for the first clone. 6a) Select the first clone. 6b) Click the Network item. Take note of the MAC address. 7) We will configure the second clone. 7a) Choose the second clone and repeat Step 6b. Take note of the MAC Address. Make sure that it is different from 6c. 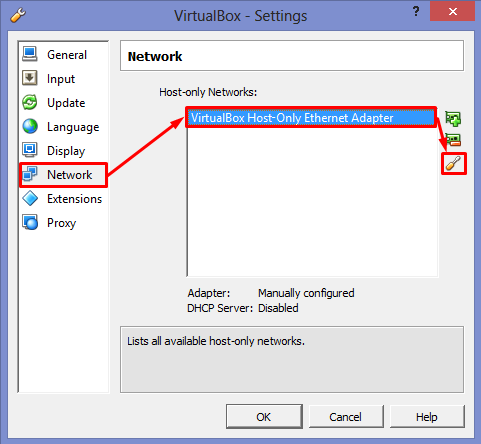 8) We will be using the DHCP of VirtualBox for a start. 8c) Set the Host-only Network Adapter. 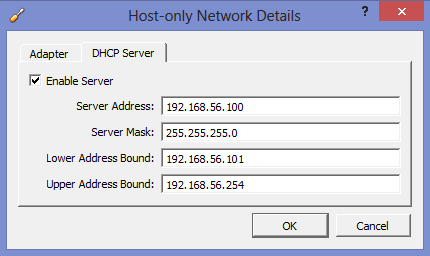 8d) Set the DHCP Server. 8e) Click OK to close the window. 9) We will start running the first clone. 9a) Select the first clone. Click the Start Button. 10) Check IP configuration for the first clone. 10a) The quickest way to do it is by clicking Start button, type "cmd" and press ENTER key. 10b) When the Command Prompt window pops up, type "ipconfig". 11) We will do the same thing for the second clone. 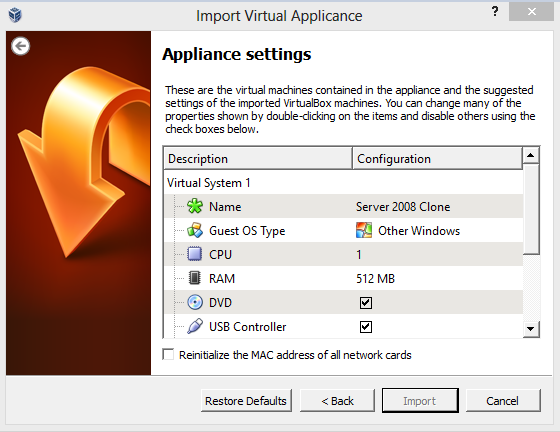 11a) In VirtualBox window, select the second clone and apply Step 9 and 10. 11b) Notice that the second clone will have a different IP address, i.e., 192.168.56.102. 12b) It looks like the Ping command doesn't reach the first clone. 12c) Switch to the first clone. 12d) Open Server Manager program. 12e) Click Configuration. 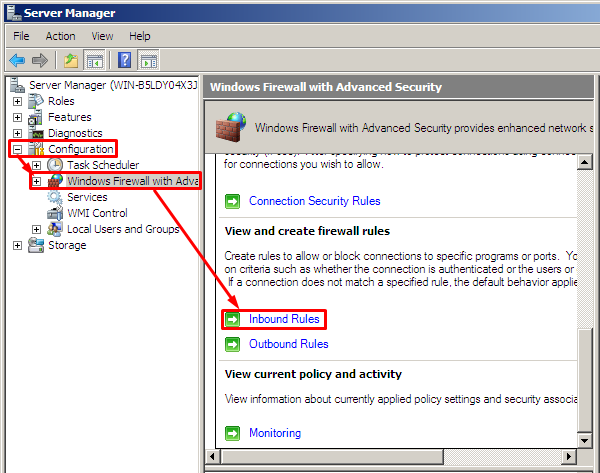 Click Windows Firewall with Advanced Settings. In the Main Panel, click Inbound Rules. 12f) Look for the item "File and Printer Sharing (Echo Request - ICMPv4-In)". Right-hand Click and choose Enable Rule. 12g) Try Ping test from the second clone again (Repeat Step 12 a). You should get a reply. 13) Apply the same inbound rule to the second clone. Check the outcome by sending Ping 192.168.56.102 from the first clone. 14) Set the first clone's name as SERVER 1. 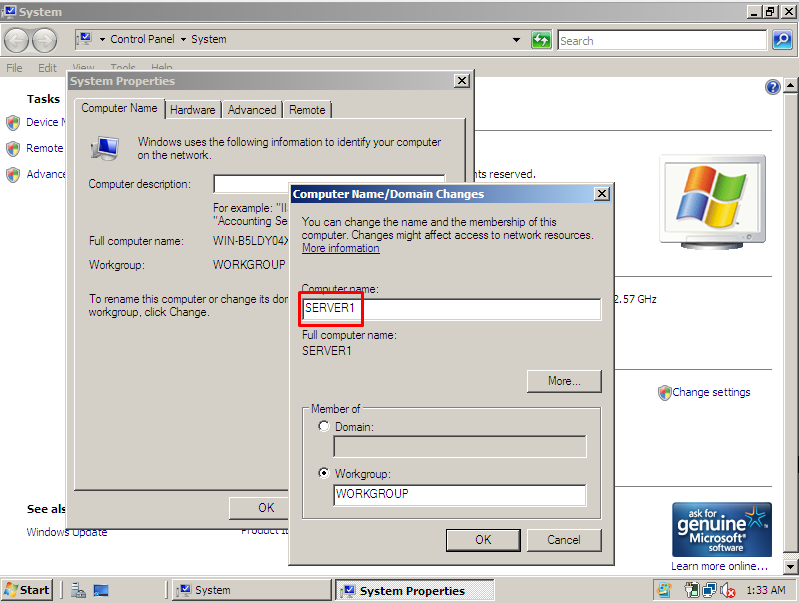 14a) Refer http://setup-steps.blogspot.com/2013/08/windows-server-2008-computer-name-and.html to get the System Properties window. 14b) Type SERVER1 for Computer name. Click OK.
14c) You will be required to restart the Server. 14e) After the server has restarted, click the START button, type network in the Search Box, the item "Network and Sharing Center" appears in program list, click the item. 15) Apply Step 14 to the second clone giving a name "SERVER2" to the computer. 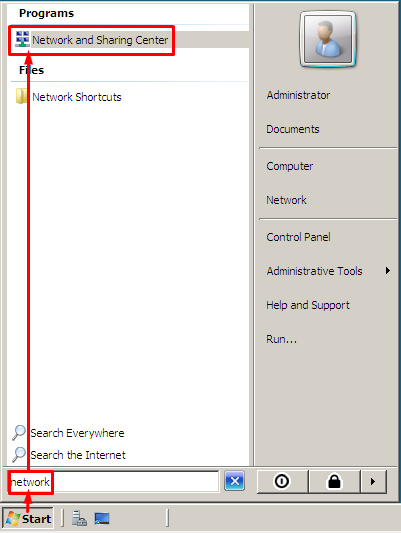 16) Now, if you click View computers and devices, a Network Window pops up and shows both of the servers. 17) The above steps demonstrated the way to share resources in workgroup. However, in practice, sharing server resources like this may expose the computer to security threats. Thank you very much Razi. You saved me a lot of time. With this method it is now fun installing Windows Server 2008 on virtual box.The method is easy and effective.